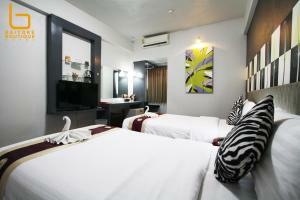 Baiyoke Boutique Hotel is located in Pathumwan, 30 metres from the Wholesale Market. It features a spa, 2 dining options and colorful rooms with flat-screen TVs. Free parking is provided. Hotel Baiyoke Boutique is a 10-minute walk from Chidlom and Phayathai BTS Station. Suvarnabhumi International Airport is a 30-minute drive from the hotel. The stylish rooms at the hotel come with modern décor and carpeting flooring. Each well-appointed room is fitted with a minibar and safety deposit box. A bathtub and hot shower facilities are also provided. Guests can visit the spa for a relaxing massage or play a game of pool in the games room. The hotel has a 24-hour front desk and provides free shuttle services from Ratchaprarop Concourse. The breakfast lounge serves a breakfast buffet, while BB Coffee Shop offers a fine selection of dishes for lunch and dinner. Please note that the hotel offers free shuttle service to Ratchaprarop Concourse (Suvarnabhumi Airport Rail Link). Guests are kindly requested to inform the hotel in advance if they wish to use this service. Contact details can be found on the booking confirmation. 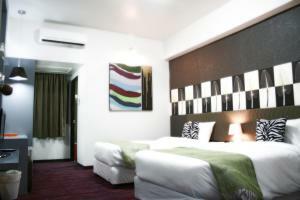 Each room is equipped with an air conditioning, a flat-screen TV, a refrigerator and a minibar. Private bathroom offers a bathtub and shower. Rate: THB 1350.00 ... THB 2200.00; select dates below to get current rates.